Ṣadr ad-Dīn Muḥammad Shīrāzī, also called Mulla Sadrā (Persian: ملا صدرا‎; also spelled Molla Sadra, Mollasadra or Sadr-ol-Mote'allehin; Arabic: صدرالمتألهین‎) (c. 1571/2 – 1640), was an Iranian Twelver Shi'a Islamic philosopher, theologian and ‘Ālim who led the Iranian cultural renaissance in the 17th century. According to Oliver Leaman, Mulla Sadra is arguably the single most important and influential philosopher in the Muslim world in the last four hundred years. Though not its founder, he is considered the master of the Illuminationist (or, Ishraghi or Ishraqi) school of Philosophy, a seminal figure who synthesized the many tracts of the Islamic Golden Age philosophies into what he called the Transcendent Theosophy or al-hikmah al-muta’āliyah. Mulla Sadra brought "a new philosophical insight in dealing with the nature of reality" and created "a major transition from essentialism to existentialism" in Islamic philosophy, although his existentialism should not be too readily compared to Western existentialism. His was a question of existentialist cosmology as it pertained to God, and thus differs considerably from the individual, moral, and/or social, questions at the heart of Russian, French, German, or American Existentialism. Mulla Sadra's philosophy ambitiously synthesized Avicennism, Shahab al-Din Suhrawardi's Illuminationist philosophy, Ibn Arabi's Sufi metaphysics, and the theology of the Ash'ari school and Twelvers. His main work is The Transcendent Philosophy of the Four Journeys of the Intellect, or simply Four Journeys. 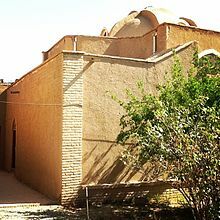 The house of Mulla Sadra in Kahak (a small village near the city of Qom, in Iran) where Mulla Sadra used to live in when he was exiled due to some of his ideas. The entrance door of the house, where Mulla Sadra used to live during his exile in Kahak. 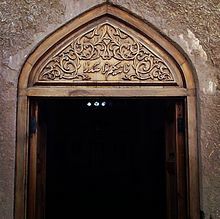 There is a sentence above of the door written in Persian which says "The house of the wise, Mulla Sadra". This is a view of the inside of the house of Mulla Sadra in Kahak. A copy of the painted portrait of him is hanged on the wall. Born in Shiraz, in what is now Iran, to a notable family of court officials in 1571 or 1572, In Mulla Sadra's time, the Safavid dynasty governed on Iran. Safavid kings granted independence to Fars Province which was ruled by the king's brother. Mulla Sadara's father, khwajah Ibrahim Qavami, was a knowledgeable and extremely faithful politician. His father was a rich man and held a high position, but had no children. However, after a lot of prayers and supplications to divine portal, God gave him a son whom they named Muhammad but called Sadra. Later he was nicknamed as Mulla, that is, great scientist. He was the only child of the minister of the ruler of the vast region of Fars Province. In that time it was prevalent that aristocrats' children were educated by private teachers in their own palace. Sadra was a very intelligent, strict, energetic, studious and curious boy and mastered all the lessons related to Persian and Arabic literature as well as the art of calligraphy, during a very short time. Following to old traditions of his time, he had to learned horse riding, hunting and fighting techniques, mathematics, astronomy, medicine to some extent, jurisprudence, Islamic law. The young Sadra, who had not reached the age of puberty, had acquired some of all those fields of knowledge however, he was mainly attracted on philosophy and particularly gnosis. Mulla Sadra was a master of all science of his time. In his own view, the most important of these was philosophy. In Qazvin, Sadra studied under two prominent teachers, namely Baha' ad-Din al-`Amili and Mir Damad. He accompanied them when the capital transmitted from Qazvin to Isfahan in 1006 A.H/1596. Mulla sadra acquired most of his scholarly knowledge from Baha' ad-Din al-`Amili and Mir Damad. Shaykh Baha was not only an expert in Islamic sciences but also a master of astronomy, theoretical mathematics, engineering, architecture, medicine and some secret supernatural fields of knowledge; it seems that Ameli for his sophis Ideas, didn't deal with philosophy more. also Miradamad as genius of his time, although knew the all science of his time but limited his domain to jurisprudence, hadith and mainly philosophy. Mir Damad was a master of both Peripatetic and illuminationist schools of Islamic philosophy. Also, Mulla Sadra obtained most of his knowledge of philosophy and gnosis from Mir Damad and always introduced him as his true teacher and spiritual guide. After he had finished his studies Sadra began to explore unorthodox doctrines and as a result was both condemned and excommunicated by some Shi'i ʿulamāʾ. He then retired for a lengthy period of time to a village named Kahak near Qom, where he engaged in contemplative exercises. While in Kahak, he wrote a number of minor works, including the Risāla fi 'l-ḥashr and the Risāla fī ḥudūth al-ʿālam . During this time in Shīrāz, Ṣadrā began writing treatises that synthesized wide-ranging strands of existing Islamic systems of thought. 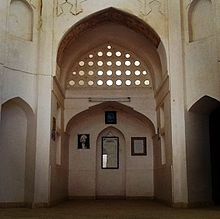 The ideas of this school, which may be seen as a continuation of the School of Iṣfahān of Mīr Dāmād and Shaykh-i Bahāʾī, were promulgated after Sadrā's death by his pupils, several of whom would become sought-after thinkers in their own right, such as, Mullā Muḥsin Fayḍ Kāshānī (the Mulla Sadra's son in law), and ʿAbd Razzāḳ Lāhidjī. Although Ṣadrā's influence remained limited in the generations after his death, it increased markedly during the 19th century, when his ideas helped inspire a renewed Akhbārī tendency within Twelver Shīʿism. In recent times, his works have been studied in Iran, Europe, and America. According to Mulla Sadra, "existence precedes the essence and is thus principal since something has to exist first and then have an essence." It is notable that for Mulla Sadra this was a question that specifically applied to God and God's position in the universe, especially in the context of reconciling God's position in the Qur'an versus cosmological philosophies of Islam's Golden Era. Mulla Sadra metaphysics gave priority "Ab initio" to existence, over quiddity. That is to say, essences are determined and variable according to existential "intensity", (to use Henry Corbin's definition), and as such essences are not immutable. The advantage to this schema is that it is acceptable to the fundamental statements of the Qur'an, even as it does not necessarily debilitate any previous Islamic philosopher's Aristotelian or Platonic foundations. Indeed, Mulla Sadra provides immutability only to God, while intrinsically linking essence and existence to each other, and God's power over existence. In so doing, Mulla Sadra simultaneously provided for God's authority over all things, while also solving the problem of God's knowledge of particulars, including those that are evil, without being inherently responsible for them — even as God's authority over the existence of existences that provide the framework for evil to exist. This clever solution provides for Freedom of Will, God's Supremacy, the Infiniteness of God's Knowledge, the existence of Evil, and a definition of existence and essence which leaves two inextricably linked insofar as Man is concerned, but fundamentally separate insofar as God is concerned. Perhaps most importantly, the Primacy of Existence solution provides the capacity for God's Judgement without God being directly, or indirectly, affected by the evil being judged. God does not need to possess Sin to know Sin: God is able to judge the intensity of Sin as God perceives Existence. All the levels of the modes of being and perception are governed by the same law of unity, which at the level of the intelligible world is the unity of intellection, of the intelligizing subject, and of the Form intelligized — the same unity as that of love, lover and beloved. Within this perspective we can perceive what Sadra meant by the unitive union of the human soul, in the supreme awareness of its acts of knowledge, with the active Intelligence which is the Holy Spirit. It is never a question of an arithmetical unity, but of an intelligible unity permitting the reciprocity which allows us to understand that, in the soul which it metamorphoses, the Form—or Idea—intelligized by the active Intelligence is a Form which intelligizes itself, and that as a result the active Intelligence or Holy Spirit intelligizes itself in the soul's act of intellection. Reciprocally, the soul, as a Form intelligizing itself, intelligizes itself as a Form intelligized by the active Intelligence. Another central concept of Mulla Sadra's philosophy is the theory of "substantial motion" (Arabic:al-harakat al-jawhariyyah), which is "based on the premise that everything in the order of nature, including celestial spheres, undergoes substantial change and transformation as a result of the self-flow (fayd) and penetration of being (sarayan al-wujud) which gives every concrete individual entity its share of being. In contrast to Aristotle and Avicenna who had accepted change only in four categories, i.e., quantity (kamm), quality (kayf), position (wad’) and place (‘ayn), Sadra defines change as an all-pervasive reality running through the entire cosmos including the category of substance (jawhar)." To paraphrase Fazlur Rahman on Mulla Sadra's Existential Cosmology: Existence is the one and only reality. Existence and reality are therefore identical. Existence is the all-comprehensive reality and there is nothing outside of it. Essences which are negative require some sort of reality and therefore exist. Existence therefore cannot be denied. Therefore, existence cannot be negated. As Existence cannot be negated, it is self-evident that it Existence is God. God should not be searched for in the realm of existence but is the basis of all existence. It should be noted that Reality in Arabic is "Al-Haq", and is stated in the Qur'an as one of the Names of God. The Causal Nexus of Mulla Sadra was a form of Existential Ontology within a Cosmological Framework that Islam supported. For Mulla Sadra the Causal "End" is as pure as its corresponding "Beginning", which instructively places God at both the beginning and the end of the creative act. God's capacity to measure the intensity of Existential Reality by measuring Causal Dynamics' and their Relationship to their Origin, as opposed to knowing their effects, provided the Islamically-acceptable framework for God's Judgement of Reality without being tainted by its Particulars. This was an ingenious solution to a question that had haunted Islamic philosophy for almost one thousand years: How is God able to judge sin without knowing sin? For Mulla Sadra a true statement is a statement that is true to the concrete facts in existence. He held a metaphysical and not a formal idea of truth, claiming that the world consists of mind-independent objects that are always true and truth is not what is rationally acceptable within a certain theory of description. In Mulla Sadra's view one cannot have access to the reality of being: only linguistic analysis is available. This theory of Truth has two levels: the claim that a proposition is true if it corresponds to things in reality; and that a proposition can be true if it conforms with the actual thing itself. Janan Izadi believes that Hikmat Muta’aliyah is of a metalanguage according to Mehdi Haeri Yazdi. That approach could evaluate the power of epistemology in Mulla Sadra’s philosophical views. However, there are two primarily groups on Mulla Sadra’s methodology. One group basically disagreed with any kind of systematizing of knowledge and methodological approach in Hekmat Muta’aliyyah. The other group believe in being structured of Mulla Sadra’s view. They maintain that there is a consistency and methodological approach for Mulla Sadra. In fact, the metalanguage approach could be considered in latter not the former. Hikmat Al Muta'alyahfi-l-asfar al-‘aqliyya al-arba‘a [The Transcendent theosophy in the Four Journeys of the Intellect], a philosophical encyclopedia and a collection of important issues discussed in Islamic philosophy, enriched by the ideas of preceding philosophers, from Pythagoras to those living at the same time with Mulla Sadra, and containing the related responses on the basis of new and strong arguments. In four large volumes; also published several times in nine smaller volumes. He composed this book gradually, starting in about 1015 A.H. (1605 A.D.); its completion took almost 25 years, until some years after 1040 A.H. (1630 A.D.). Book is also translated in Urdu by Indian scholar Abul Ala Maududi by the name of Asfar e Arba. Si Asl, Mulla Sadra's only extant book of philosophy in Persian. Here, by resorting to the main three moral principles, he has dealt with moral and educative subjects related to scientists, and advised his contemporary philosophers. ‘Arshiyyah, also called al-Hikmat al-‘arshiyyah, a referential book about Mulla Sadra's philosophy. As in al-Mazahir, he has tried to demonstrate the Beginning and the End concisely but precisely. This book has been translated by Professor James Winston Morris into English with an informative introduction. al-Mazahir This book is similar to al-Mabda‘ wa’l-ma‘ad, but is shorter than it. It is, in fact, a handbook for familiarizing readers with Mulla Sadra's philosophy. al-Shawahid al-rububiyyah, a philosophical book, written in the Illuminationist style, and represents Mulla Sadra's ideas during the early periods of his philosophical thoughts. al-Shawahid al-rububiyyah, a treatise not related to Mulla Sadra's book of the same name (see above). It is an inventory of his particular theories and opinions which he had been able to express in philosophical terms. Sharh-i Shafa, a commentary upon some of the issues discussed in the part on theology (Ilahiyyat) in Ibn-Sina's al-Shifa. Sharh-i Hikmat al-ishraq, a useful and profound commentary or collection of glosses on Suhrawardi's Hikmat al-ishraq and Qutb al-Din Shirazi's commentary upon it. Khalq al-a’mal, a treatise on man's determinism and free will. al-Mizaj, a treatise on the reality of man's temperament and its relation to the body and soul. Mutashabihat al-Qur'an, a treatise consists of Mulla Sadra's interpretations of those Qura’nic verses which have secret and complicated meanings. It is considered as one of the chapters in [Mafatih al-ghayb]. al-Hashriyyah, a treatise on resurrection and people's presence in the Hereafter, it deals with man's being rewarded in paradise and punished in hell. al-alfazh al-mufradah, an abridged dictionary for interpreting words in the Qur'an. Radd-i shubahat-i iblis, explaining Satan's seven paradoxes and providing the related answers. Kasr al-asnam al-jahiliyyah (Demolishing the idols of the periods of barbarism and man's ignorance). His intention here is to condemn and disgrace impious sophists. A Collection of Scientific-Literary Notes, some short notes of his own poetry, the statements of philosophers and gnostics, and scientific issues have been left from his youth, which comprise a precious collection. This book can familiarize the readers with subtleties of Mulla Sadra's nature. These notes were compiled in two different collections, and it is likely that the smaller collection was compiled on one of his journeys. ^ Janan Izadi (2007). Meta language as a theory for methodology of Hikmat Muta'aliyeh. Kherad nameh Sadra. pp. 21–22. Leaman, Oliver (2013). Islamic Philosophy. John Wiley and Sons. ISBN 0745659071. Nasr, Seyyed Hossein, Sadr al-Din Shirazi and his Transcendent Theosophy, Background, Life and Works, 2nd ed., Tehran: Institute for Humanities and Cultural Studies, 1997. Rahman, Fazlur, The Philosophy of Mulla Sadra, Albany: State University of New York Press, 1975. Morris, James (trans. ), The Wisdom of the Throne, Princeton: Princeton University Press, 1981. Chittick, William (trans.) The Elixir of the Gnostics, Provo: Brigham Young University Press, 2003. Rizvi, Sajjad, Mulla Sadra Shirazi: His Life, Works and Sources for Safavid Philosophy, Oxford: Oxford University Press, 2007. Peerwani, Latimah (trans. ), On the Hermeneutics of the Light Verse of the Qur'an. London: ICAS, 2004. Jambet, Christian, The Act of Being: The Philosophy of Revelation in Mulla Sadra, Trans. Jeff Fort, New York: Zone Books, 2006. Zailan Moris, Revelation, Intellectual Intuition and Reason in the Philosophy of Mulla Sadra: An Analysis of the Al-Hikmah Al-'arshiyyah, London: Routledge Curzon, 2003.